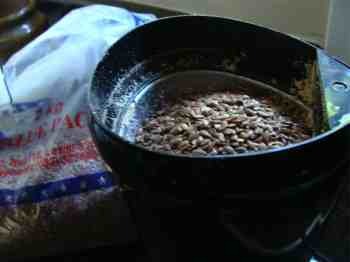 Grinding flax seeds yields a great source of healthy fatty acids. Grinding flax seeds yields a great source of daily fresh omega-3 fatty acids. It takes me 20 seconds every morning to significantly increase the omega 3 in my diet. In fact, I cheat a little; whizzing the seeds does enough for the two of us, and the rest goes into the bread I bake most mornings, with some left over for tomorrow. So I prepare them perhaps once a week these days; the surplus is stored in the freezer. What's odd is that freshly ground seeds have a very faint fishy smell; the odour that we associate with salmon, mackerel and pilchards, for example, is actually from the omega 3. But it's so faint that it won't turn your stomach; in fact I sometimes wonder if I'm hallucinating. But the long and the short of it is that cold water fish, in particular, and flaxseed are the two richest sources of this wonderful fat. The brain is rich in fat, and about 8 percent of it consists of these omega 3 compounds. Folk who consume little or none were found to have brains that were actually smaller, equivalent to being two years older than those who ate plenty of fish and or flaxseed. It's particularly true in pregnancy; research published in Lancet concludes that the children of women who consumed little omega 3 were 50 percent more likely to score significantly low on IQ testing. Today much research is concluding that omega 3 has a profound role to play in those suffering from Alzheimers, premature senile dementia, depression and bipolarism. 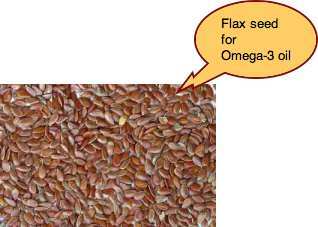 If you check out this Flax Seed Nutrition Information page you'll see that flaxseed (aka linseed because it's loaded with alpha linoleic acid - an important omega-3 fatty acid) is the richest vegetarian source of omega-3. Like sesame seeds, eaten whole, flax seeds pass through the intestines without being digested; it's a complete waste and, worse, they may get stuck in any diverticuli you may have. Hence this grinding flax seeds page. Anti inflammatory omega-3 is vital to reduce the pain in our joints and muscles; enter this grinding flax seeds page. The good news is that with a cheap coffee grinder you can turn your flax seeds into an absorbable powder, rich not only in omega-3 but also the lignans that have now been proved to have strong anti prostate and breast cancer properties. Thus it comes as no surprise to me to discover recently that my PSA is less than one; under four is considered normal at my age. They are the phytosterols that both compete with cholesterol in the gut for absorption sites (and reduce cholesterol by the same amount as statins, the cholesterol-lowering drugs), but also block the hormone sites in the breast and prostate where circulating cancer-stimulating hormones are absorbed. Flax seeds are cheap. On the left of the grinder below you can a one kilogram packet of flaxseeds that cost only R37 in South Africa. About $2 per pound. That is 3-4 months' supply. Cheap. Toss a couple of tablespoons into the blender. Grinding flax seeds helps lowering the omega 6 to 3 ratio which is vital to reduce inflammation in muscles, joints and blood vessels; probably in the intestine too for example. Whizz it for 10-20s and voilà, you have your ground flax seeds powder. What could be easier? 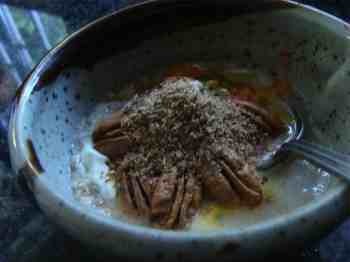 This looks like a dog's breakfast, but I promise you it's loaded with good stuff; and tastes delicious. It takes less than five minutes to put together; while it soaks in boiling water for a fewfive moments, I enjoy a cup coffee and shave. Nuke it briefly if you like. 1 TBSP of dried cranberries. Cover with boiling water and nuke it for 1 min. Allow to stand for five minutes. 2 tsp freshly ground flax seeds. On alternate days we enjoy eggs Florentine for breakfast; it's equally good. The omega-3 fat, Alpha Linolenic acid, or ALA, is a very powerful anti oxidant and, exposed to air gets very rapidly hot and goes rancid. Make sure you refrigerate or better still freeze any left over. In particular, make sure that both your elderly parents are your children are getting adequate levels of cold water fish and flaxseed in their diets. Kids suffering from attention deficit, and those who displayed aggression in school, also respond well to these three fatty acids; omega 3 is brain food, as well as for the joints, muscles and blood vessels; read more at the pathophysiology of atherosclerosis page below. It's scripted in simple layman's terms. Every family should be grinding flax seeds on a regular basis. I use grinding flax seeds regularly for our vegan seed bread recipe; although we are do eat meat, we do log into all the benefits of those who enjoy plenty of salads, fruit and the healthy loaf. To a very large extent it means growing and baking your own food. It's either that or spend all that time visiting doctors and swallowing bucketful of pills, not to mention the pain and the cost. It does mean retraining the tongue; sugary sweet rolls, bagels and highly refined scones should be kept for high and holy days. The research is unequivocal; and it's probably the lignans in the freshly ground powder, but not in flaxseed oil that makes the difference in the management of your cholesterol profile. Read more at ground flaxseed vs oil research. Healthy choice foods, if you don't want a body consumed with inflammation, must include plenty of omega-3 fatty acids. 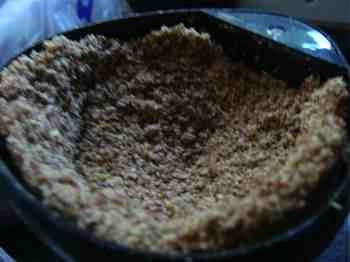 The best sources are fatty fish and freshly ground flax seeds; grind 'em yourself. Bernard Preston, yes, that's me, is committed to helping you enjoy healthy choice foods that can be made in a jiffy. Well, our low GI bread takes five hours to bake, but it's only 5 minutes of preparation time, including grinding flax seeds that lower the glycemic index of the starch in our daily loaf. 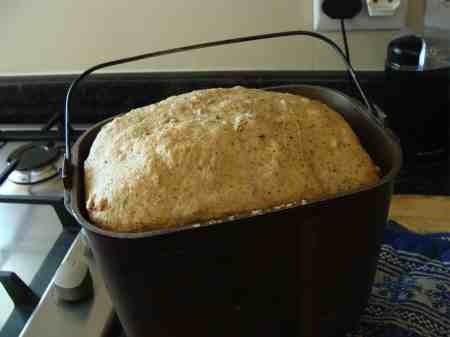 Low GI bread - rich in lignans too. Wheat seeds like grinding flax seed are a ground source of both lignans and healthy fatty acids, but there is a proviso for some; the protein is more difficult to digest. Understanding the meaning of gluten is important if bread gives you abdominal pain, cramps or diarrhoea. Luckily there is a solution; you can have your bread and eat it, even if you are gluten intolerant, but you have to learn how to make sourdough. It's not difficult; once you're into the swing of it, it takes only five minutes every day and you can enjoy your daily loaf.